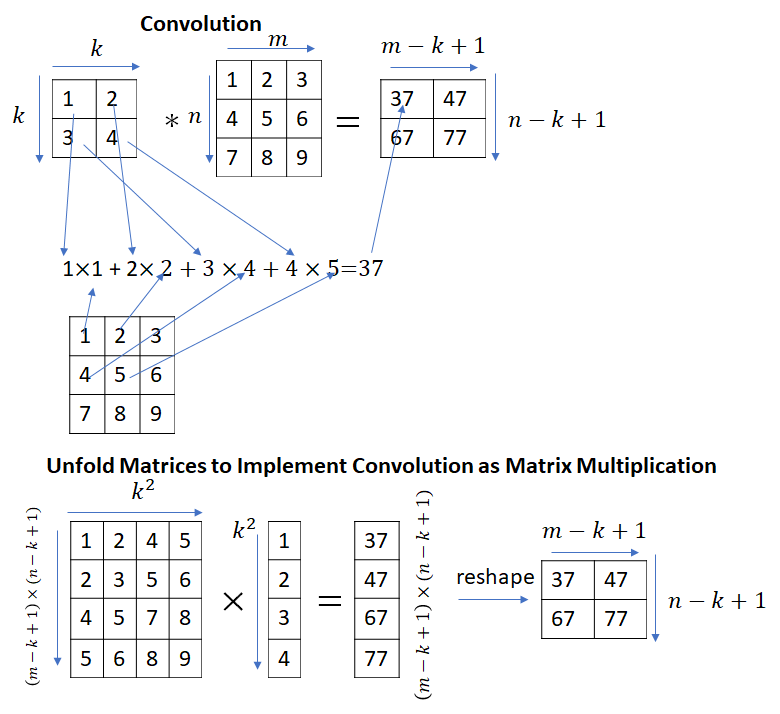 Section 1 – Implementing Convolution as Matrix Multiplication: You may notice that the same initialization method is used to initialize both fully connected and convolutional layers. Convolution and matrix multiplication are different mathematical operations and it’s not obvious how or why the same method can be used for both operations. In this section, we’ll show how this works. Section 2 – Forward Pass (Without Bias): In this section, we’ll present a detailed proof of the variance propagation equations presented in He et al. paper and show some simulation results. Section 2 – Forward Pass (With Bias): He et al. paper sets the bias to zero. In this section, we turn bias into a random variable and show how the parameters of the distribution from which bias is drawn should be set. Section 4 – Other Rectifiers: In this section, we consider other commonly used rectifiers such as tanh and sigmoid functions. This immediately begs the question – convolution and matrix multiplication are different operations, how can matrix multiplication be used to implement convolutions? It turns out that by appropriately unfolding the input matrix (or the kernel matrix), convolutions can be implemented as a matrix multiplication. 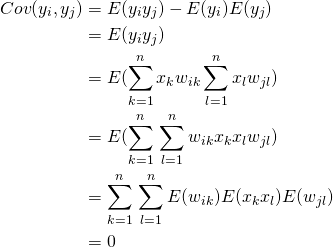 Strictly speaking, the calculation shown in the picture above implements correlation instead of convolution. Convolution can be implemented by simply flipping the kernel matrix along the rows and columns. We have only considered the case where the convolution kernel has one channel ( ). It is easy to see how the technique shown here can be generalized to more than one channel. In this case, the filter kernel matrix will be flattened to a vector. There are a few other parameters related to convolution operation such as stride length and padding. For more information, see Karpathy’s post and also my post. In our example, stride length = 1 and padding = 0. CuDNN v1.0 released in Aug 2014 used matrix multiplications to implement convolutions. This is computationally efficient because highly optimized libraries implementing matrix operations are already available. However conversion to matrix multiplication is not the most efficient way to implement convolutions, there are better methods available – for example Fast Fourier Transform (FFT) and the Winograd transformation. Generally speaking, FFT is more efficient for larger filter sizes and Winograd for smaller filter sizes ( or ). These implementations have become available in successive releases of CuDNN. A timeline is shown below. Notice that the standard deviation of the weights for a layer depends on the dimension of the layer. Thus, it is clear that for a network with multiple layers of different dimensions, a single choice for the standard deviation will not be optimal. 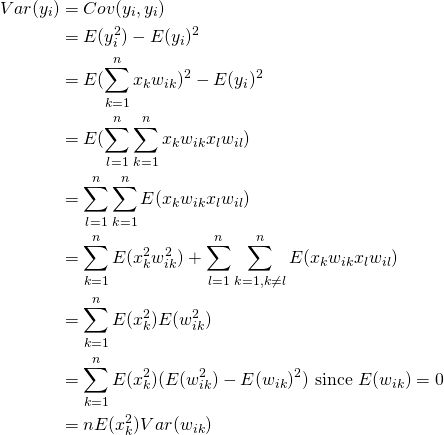 Let’s now consider the proof of the equations shown above and some simulation results. Let’s first look at the proof for . Here, is an element of the input vector . Here the last equality is due to the fact that and are identically distributed. Note that and need only be mutually independent, not identically distributed. To underscore this point, when we look at simulation results, we’ll draw from a uniform distribution and from a normal distribution. 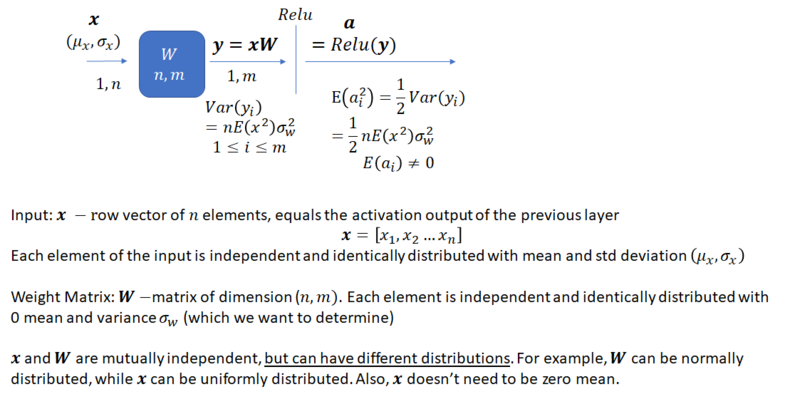 Now, let’s look at the proof for for the ReLU activation function. Note that because in general. However the cool part is that we don’t need the variance of to propagate the recurrence to the next network layer. is all we need. In section 4, we’ll consider a general activation function of the form . Dropping the subscript , , . This completes the proof. Now let’s look at some simulation results which will validate the results presented here. Our simulation framework consists of a simple 10 layered network consisting of alternating layers of and weight matrices. Input is a vector where each element is drawn from a uniform distribution (0,1). Thus, . We’ll run the forward pass 100,000 times with randomly generated input and weights and look at the distribution of the network output. In each trial, the weights are drawn from a normal distribution with a mean and variance chosen using the method described here. The python implementation is shown below. # input to the network is uniformly distributed numbers in (0,1). E(x) != 0. # Note that the distribution of the input is different from the distribution of the weights. This agrees with the formulas presented earlier. Let’s now consider the effect of adding a bias (which is a random variable instead of being initialized to 0) during the forward pass. Note that we haven’t performed any analysis on the effect of making the bias a random variable on network performance. 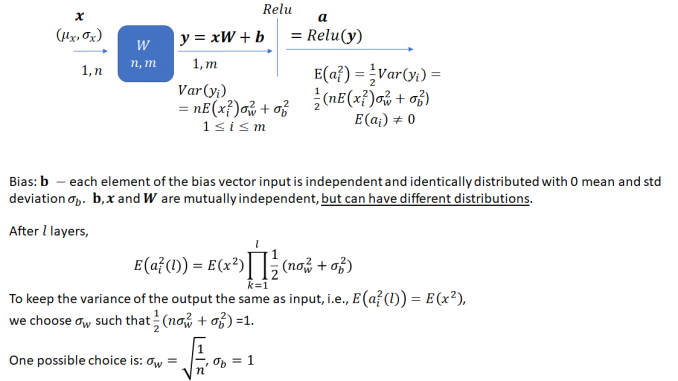 The analysis presented here simply suggests a way to set the parameters of the distribution from which bias is drawn. Making the bias a random variable instead of setting it to zero may change the convergence properties of the network. now has an additional term – the variance of the bias. Let’s first look at the proof and then consider how to select and such that variance of the network output remains bounded. What about the Backward Pass? 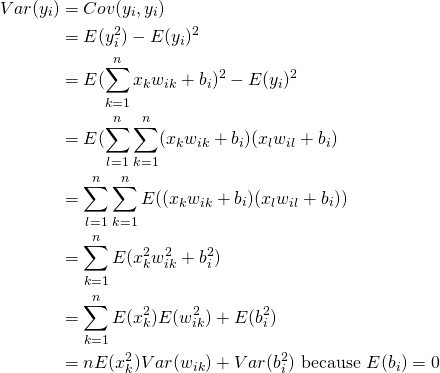 Using Taylor series expansion, we can express many of the commonly used activation functions in the form . Let’s consider the taylor series expansion for sigmoid, tanh and ReLU activations. 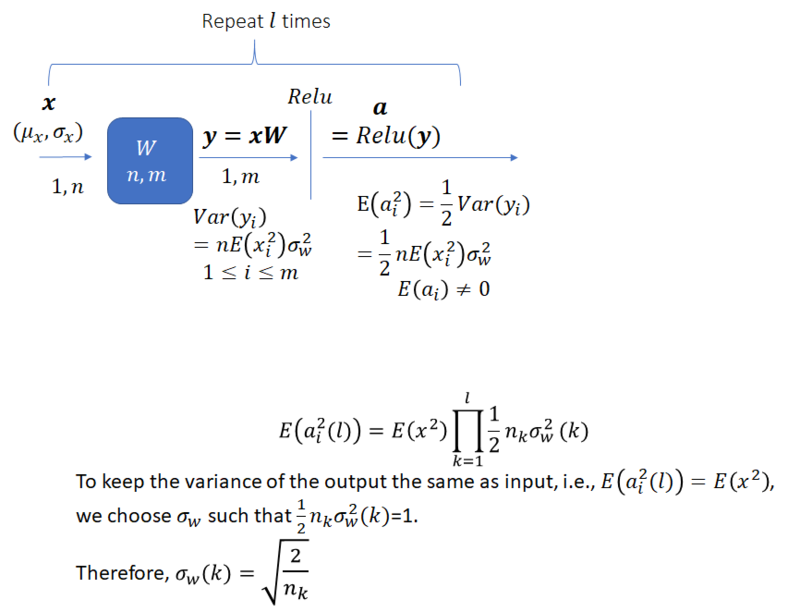 Both tanh and ReLU activations have the desirable property that and thus our initialization method will ensure that the variance of the output will lie in the proper range. However this is not true for the sigmoid function – first, which means that the dependence of the output on the input will decrease as the network gets deeper, second, which makes the output gradient increase with each layer. I confirmed the first point in my simulation. Keeping the weight initialization method same as before (i.e, setting ), the variance of the output doesn’t change when I scale the input by a factor of 3. However, as pointed out in (https://arxiv.org/pdf/1602.05980.pdf), and is not a fatal flaw. It can be corrected by rescaling the sigmoid activation function and adding a bias. The key point to understand is the standard method to initialize weights by sampling a normal distribution with and is not a “universally optimal ” method. It is designed for the ReLU activation function, works quite well for the tanh activation and not so well for sigmoid.